Amazing World: Amazing Medical Advances Heal Wounded Troops !! Amazing Medical Advances Heal Wounded Troops !! 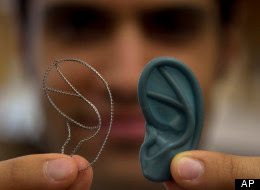 BOSTON -- Scientists are growing ears, bone and skin in the lab, and doctors are planning more face transplants and other extreme plastic surgeries. Around the country, the most advanced medical tools that exist are now being deployed to help America's newest veterans and wounded troops. _In Los Angeles, surgeons used part of Michael Mills' forehead to rebuild his nose after a bomb disfigured him in Iraq. _In Pittsburgh, doctors used an experimental therapy from pig tissue to help regrow part of a thigh muscle that Ron Strang lost in a blast in Afghanistan. _In Boston, scientists are making plans for the first implants of lab-grown ears for wounded troops after successful experiments in sheep and rats. _In San Antonio and other cities, doctors are testing sprayed-on skin cells and lab-made sheets of skin to heal burns and other wounds. The ingenuity is impressive: One product was developed from foreskin left over from circumcisions. Much of this comes from taxpayer-funded research. Four years ago, the federal government created AFIRM, the Armed Forces Institute of Regenerative Medicine, a network of top hospitals and universities, and gave $300 million in grants to spur new treatments using cell science and advanced plastic surgery. "The whole idea is to bring all these researchers together to develop these great technologies that were in early science to eventually be ready for the troops," said AFIRM's recently retired director, Terry Irgens.